Sam Ludeman is a musical force to be reckoned with. 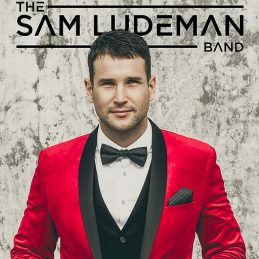 Already having years of experience gracing Australia’s largest stages and with high profile performances both nationally and internationally, Sam is already proving to be one of Australia’s premier performers. Currently he has been wowing the corporate scene with his powerhouse party band, bringing current hits and classics to life in his own unique and very charming way. Sam initially received national attention after becoming a finalist on Nine Network’s first season of The Voice, earning a coveted position on Team ‘Seal’. Also on TV Sam has been seen playing Curtis ‘the kid’ Conlon for Channel 7’s City ‘Homicide’, modelled and shot with Myer for their boxing day sale catalogue and more recently as the hero characters in two national TVC’s for VW Polo and William Hill. ‘Kenickie’ in the Australian/Singapore tour of Grease; as ‘Joe Vegas’ in Fame; and as ’Sonny Malone’ in Xanadu and many more. Sam recently finished shooting his first feature film playing supporting role Jim Davis in the soon to be released “The Spirit Of The Game”. A true triple threat, with his smouldering good looks, amazing voice and acting talent, no doubt you’ll be seeing and hearing a great deal more from Sam Ludeman in 2016.